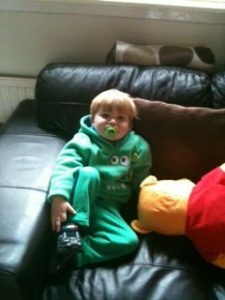 My youngest loves Winnie the Pooh, so when we were asked to review the DVD I was delighted. My oldest just started school so once I’d dropped him off, my youngest Tyler and I settled down on the couch to watch Winnie the Pooh DVD. Not forgetting Pooh bear himself joined us on the couch. Description:- Walt Disney Animation Studios returns to the Hundred Acre Wood with “Winnie the Pooh.” Featuring the timeless charm, wit and whimsy of the original featurettes, this all-new movie reunites audiences with the philosophical “bear of very little brain” and friends Tigger, Rabbit, Piglet, Owl, Kanga, Roo—and last, but certainly not least, Eeyore, who has lost his tail. “Ever have one of those days where you just can’t win, Eeyore?” asks Pooh. Owl sends the whole gang on a wild quest to save Christopher Robin from an imaginary culprit. It turns out to be a very busy day for a bear who simply set out to find some honey. Inspired by three stories from A.A. Milne’s books in Disney’s classic, hand-drawn art style, “Winnie the Pooh” is available on DVD and for digital download on August 22nd, 2011.
Review:- We loved the DVD. Tyler loves Winnie the pooh and the DVD kept him captuvated for almost an hour a world record as he pays much attention to DVD’s, etc. He was singing along to the lovelable songs and dancing with his pooh bear. We carried on singing those lovable and familiar songs with the soundtrack in the car. I loved it almost as much as he did, it was a great story with all the soft, squishy and cute A.A. Milne characters. With some morals thrown in for good measure. The story is adorable and so lovely. The animation, amazing, bright and vibrant as you would expect from Walt Disney. Winnie the Pooh is a great film for both children and adults a like it’s a classic which never grows old. I would highly recommend this to all Winnie the Pooh fans, both young and old. It is the perfect parent, child bonding film. The DVD is available from Monday 22nd of August. In the meantime you can check out the Website, for more updates check out facebook and there are some great activity sheets for you to download and do with your little one. Disclaimer:- I was sent this DVD &amp;amp; sound track for review in exchange for an honest review, which I have given above.